What it’s about: When Last Night came, all the rules of the world were rewritten as humanity fled from the plague-stricken hungry for human flesh. But inevitably, some semblance of normality has returned, even in a post-apocalypic world, and Mark Spitz is part of the plan for a future, employed in Zone One, once Manhattan below Canal Street, and the future first resettled city in America. For now, he and his team of sweepers search buildings for remaining monsters, eliminating the already dead but still around. They’re part of the second wave, after the marines razed the island with gunfire. Mark and his team of civilians now clean up the stragglers. But in this day and age, the distinction between civilian and military has ceased to matter. They’re all survivors. Zone One is what a good zombie book should be. It’s an exploration of humanity, what drives us, where our dreams lie, how we plan for the future, how we learn to hope, and what keeps us alive. Whitehead uses New York as that eternal symbol of renewal, a city that has constantly remade itself, where people go to start fresh, where we bring our dreams, however fantastic, and believe that through hard work and persistence they’ll become a reality. Through flashbacks we relive Mark Spitz’s journey, starting with the horrors he found in his house on humanity’s Last Night and following his travels through horrible Connecticut, the few micro-families he formed along the way, and the ultimate disintegration of each one in much the same way and with the same result: once again alone, but alive. I was struck by the poetic language and its dreamlike and meditative quality. Though on the surface we’re reading an apocalypse account, we’re also reading about the other in each of us. 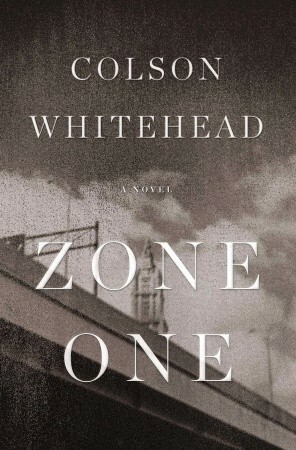 Whitehead creates two brands of zombie: the “skel,” the familiar mindless wandering creature intent on devouring human flesh; and the “straggler,” an almost motionless shell trapped in the act of some everyday task—at the copy machine, flying a kite, washing a dish. It’s the stragglers that Mark and his team of sweepers are charged with eliminating, and their quiet dedication to a place is eerie and almost religious. Mark sees in them the faces of his dead neighbors and friends, ascribing significance to their final resting places, though there’s no evidence that any thought or reason draws them to a particular area. It’s this very threat of chaos that frightens and intrigues Mark—if the dead come to these places for no reason, if everything is random, is the world only chaos, the future only an illusion? As a consummate survivor he knows that’s true, but nonetheless, he plays the game, Solve the Straggler, piecing together a narrative that led them here to a quiet corner of New York City. I enjoyed Zone One for its depth and for being a study in the potential of zombie stories and a reminder of why they resonate with us. It’s not for the horror and gore of humans changing into cannibalistic monsters or the gruesome survivalist resolve that leads one hero through the wilderness. It’s for what they tell us about humanity and our own fears about death and the mob. Zombie books should really be psychological, not physical in nature, and Whitehead does of brilliant job of capturing this. Would I recommend? Yes. Don’t let zombie fatigue get you down. Zone One is a high class of undead literature and worth a look. 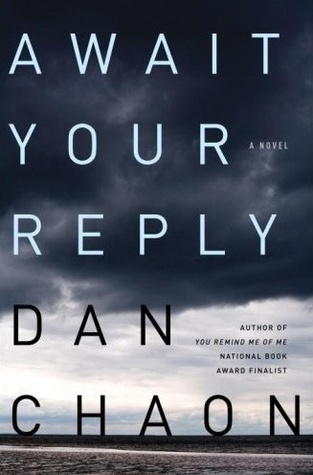 What it’s about: Await Your Reply is a book that you discover page by page. Each sentence, each word, reveals something new until suddenly, like a freight train, it hits you and you get it. Interestingly, an interview in the back of the book suggests that even the author had this experience. Chaon says that he began the book with a series of vignettes–a lighthouse motel on the edge of a dry lake in Nebraska, an old atlas marked up with imaginary landmarks, a magician suffering a heart attack onstage–and expanded them into a story, getting to that same aha moment when he suddenly felt the story coalesce. That moment of realization is one of the major draws of the book, so let it be known that everything I’m about to tell you about the plot happens in the first couple chapters. And that’s saying a lot. Await Your Reply follows three different characters. The first is Ryan, who is in a speeding car on the way to the hospital with his father. Ryan’s severed left hand is resting in a bucket of ice beside him and he’s wondering if he’ll survive the night. He’d been trying to reinvent himself, he’d given up his old life for something new and daring, but it’s all breaking up now, it’s clearly taken a wrong turn. Lucy is trying to be someone new as well. She’s run off with her high school history teacher, George Orson, and they’re holed up in an abandoned motel owned by his family in Nebraska. George has promised they’ll be rich and his Maserati and Ivy-league past made her believe him. She imagines a glamorous new life for herself in Rome or Paris, but instead she’s spending her days watching old movies while George holes up in the study, ostensibly planning their future together. She is slowly realizing that George Orson’s plans aren’t entirely legal and that their idyllic times as just “Lucy and George” are about to come to an end. What it’s about: A New York writer comes to Savannah on holiday and is seduced by the Southern charm and surprising characters he meets. He befriends a piano-playing charlatan, a drag queen, a witch doctor, an inventor threatening to poison the town’s water supply, and a murderer. Oh, and did I mention this is non-fiction? The focus of Midnight in the Garden of Good and Evil is a murder trial, but it’s really only a backdrop for extended character profiles of some of the most eccentric yet real characters I’ve ever encountered. Savannah is not too far away from my home town (which is referenced several times in the book), so I found myself smiling with familiarity and nodding when the Florida-Georgia game was called a national holiday, although I object to being referred to as the “Florida barbarians.” For those not from the South, I promise you that this really is an accurate portrayal of the lunatics (a term I use lovingly) that you’ll find down there. Warm, friendly, drunk, and crazy, the characters in this book are the real stars, along with the city itself. You really get lost in the fairy tale quality of Savannah. Book v. Film: So, by the way, I’m in a book club (hi guys!). This was our pick for February and we decided to compare the movie and book at a pot luck dinner. This was really just an excuse for us to drink lots of wine and eat delicious food. Here’s our menu, in case you’d like to replicate our Southern-influenced evening: vegetable lasagna, cheese grits, sweet potato biscuits, salad, blueberry pie, and three bottles of $3 Trader Joe’s wine. Our thoughts on the movie? Well, like most book-to-film adaptations, we were disappointed. The main problem was that the movie was just … boring! What it’s a bout: Mikael Blomkvist is a journalist who has just been convicted of libeling one of the most powerful businessmen in Sweden. Lisbeth Salander is a private investigator (with a dragon tattoo) who is considered seriously unstable by the state. The two are thrown together in this fast-paced murder mystery as an aged tycoon hires them to solve the muder of his granddaughter Harriet Vanger, who disappeared from their family estate almost forty years ago. Her bereft grandfather Henrik has searched for her killer ever since, convinced that a member of his own family murdered Harriet in cold blood. The book sounds kind of ridiculous when you explain it. I mean, the story includes sadists, serial killers, Biblically allusive murders, sexual exploitation, and a couple Nazis. But it’s a great read. I think it targets a Da Vinci Code demographic: it’s a commercially appealing, fast-paced thriller with plenty of intrigue thrown in. It’s even pretty smart. A word of warning: it took me a couple chapters to get into it. The story is set in Sweden, so the names are foreign and hard to remember for an American reader. 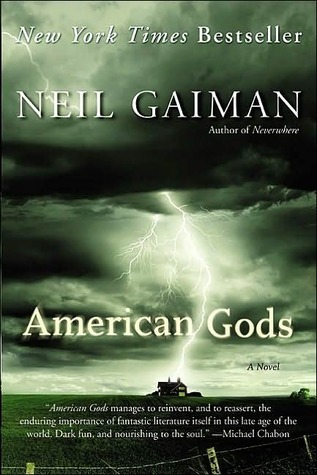 And the beginning of the story is kind of confusing as Larsson tries to weave together the many different characters. It takes at least five chapters before it starts to get good.